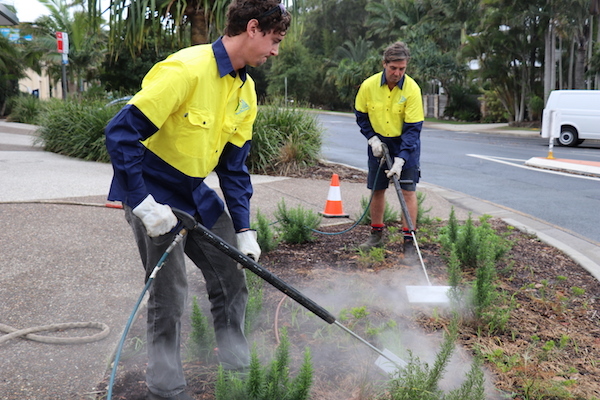 Byron Shire Council workers are using a new steam weeding machine to keep public areas free of weeds without using chemicals. The mobile unit is being used by the council’s open spaces team as part of efforts to stop using herbicides by 2018. The council’s Open Spaces manager Michael Matthews said the council resolved to phase out herbicides in 2015. ‘This machine is highly effective at killing weeds without the use of chemicals and I know that anything that reduces the use of herbicides will be welcomed by our residents,’ he said. ‘Staff are using it to kill weeds in and around children’s playgrounds which is a relief to many parents who feel strongly about the use of herbicides and other chemicals. ‘We are also using the steam weeder in retail areas of our towns and villages and other popular spaces such as picnic areas. ‘The steam weeder is a mobile unit operated by the Open Space team who use a wand to spray steam onto weeds and into the ground to penetrate their root systems. ‘An added bonus is that we are also able to use it as a steam machine to clean playground equipment, tables and paths,” he said. ‘For many years our residents have been telling Council they are not happy with society’s reliance on chemicals and we hear their concerns. Mr Matthews said steam the machine, supplied by Australian company Weedtechnics, is regarded as one of the best and most efficient on the market.